But who decides if you can be trusted, and how can you make it happen? In the United States, over the last few years, various programs have been instituted by the U.S. Department of Homeland Security, Customs and Border Patrol (CBP), and by the Transportation Security Administration (TSA). All are attempts to make things easier and save you time getting through security at airports or getting through customs. These programs provide expedited travel procedures for pre-approved, low risk travelers. 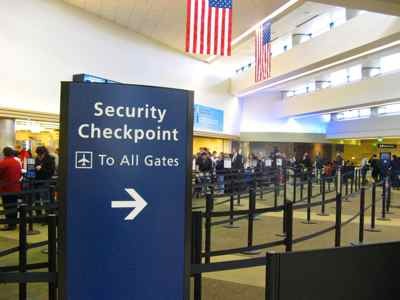 If approved, they allow you to pass through special lanes and kiosks at certain airports and border crossings. They’re great when you can use them, but they are not available at all airports. TSA Pre-Check is the one you will encounter at the beginning of your trip… and the only one if you are traveling domestically in the USA. This one is not for customs, but it will get you through security faster and with fewer hassles at many airports in the US. You get to use a special faster line in security. You can leave your shoes, belt and light jacket on. You usually go through the magnetometer instead of the body scan. You may be randomly selected too. Look at your boarding pass... just above or below your name. 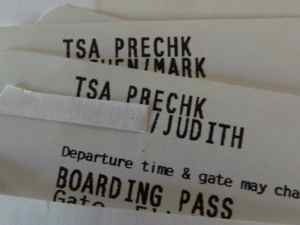 If you see something that looks like TSA Precheck... or some variation... lucky you! --Some members of airline frequent flyer programs are included by the airlines. --Some passengers are randomly assigned to TSA Pre✓™. --If you are a member of one of the Trusted Traveler Programs listed below, you can sometimes be included. The Global Entry Program is a Trusted Traveler Program that is your express pass to get quickly through the United States' international arrival areas. Automated kiosks are designed to process pre-approved, low risk international travelers who qualify. This U.S. Customs and Border Protection program is still designated as a pilot program. They hope it allows them to get trusted travelers through the airports faster and concentrate their resources on higher risk travelers. The plus for you is that it allows you to bypass the regular passport processing lines. If you apply, you will be fingerprinted, photographed, and questioned about your past, and there will be an FBI background check. You will pay US$100 for this, and that fee is non-refundable should you be denied Trusted Traveler status. Check The Customs and Border Patrol site for details. No, this is not a real Global Entry Kiosk. You know you can't take photos in the Customs area! This is an airline kiosk... But they look similar. 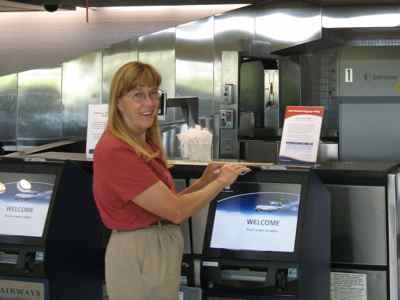 Global Entry members insert their passport into a document reader and provide digital fingerprints for comparison with fingerprints on file (biometric verification). They snap a picture of you; you then answer customs declaration questions on the touch screen and get a transaction receipt. You will be directed to baggage claim and the exit unless chosen for a selective or random secondary inspection. Just present the receipt to the Customs officers before leaving the inspection area. The Global Entry Program is currently only open to citizens and permanent residents of the United States. The Netherlands has a reciprocal arrangement, so citizens of the Netherlands may also apply (through their Privium program in Amsterdam). One more thing about this program is that you are also enrolled in TSA Pre✓™ once you are enrolled in Global Entry. That makes it a bargain because the PreCheck fee is $85 by itself as of this writing. The NEXUS Program expedites travel between the United States and Canada. NEXUS cards are WHTI (Western Hemisphere Travel Initiative) compliant documents. These cards are used for land and sea travel, as well as air travel when traveling to and from airports using the NEXUS programs. Note: Airports must be among the ones who are using the NEXUS program. The application fee for this card is US$50. SENTRI cards are also WHTI compliant. This is a United States-Mexico border crossing program. It serves the largest points of entries into the U.S. There are several fees involved because there is a FRID (radio frequency identification)card issued for vehicles. There is one other program which mostly applies to truck drivers. FAST stands for Free And Secure Trade. It allows expedited release to approved commercial truck drivers making fully qualified FAST trips between the US and Canada or the US and Mexico. For details on all of these Trusted Traveler Programs, check the U.S. Department of Homeland Security, Customs and Border Patrol websites. All of these programs will be most useful to frequent and business travelers, but anyone can apply for them. It may be that in the future Trusted Traveler Programs will be expanded to include reciprocal agreements with more countries. Already, we are being encouraged to enroll in programs like this.